Save up to $2000 on Samsung Black Friday Deals! Save More Than $2000 on All Week Long Black Friday Deals! Samsung has started its annual Black Friday shopping festival starting today. The Korean mobile tech giant is offering some crazy discounts which can save you as much as $2000 on a smart TV! Today starts the madness that holiday season brings into the shopping groups. While Thanksgiving may be a week away, Samsung has started its week long shopping festival which will run through the Black Friday weekend. Here are some of the best deals that you can get from Samsung Black Friday offerings. For the complete list of deals and discounts, please check the link at the end of the post. 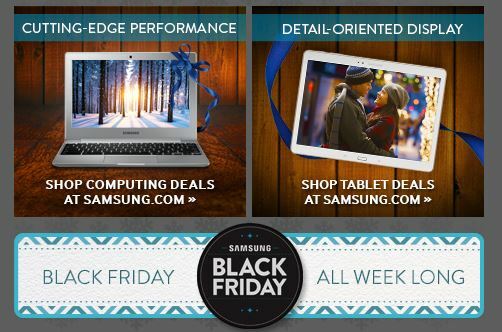 For more deals and discounts, please visit official Samsung Black Friday page at this link.